One thing I set out to do a year ago is talk about tools I use and why I like them. This time of year the bulky machine commands ample space in between my living room and kitchen. It’s a wonderful machine and I was fortunate to locate a ribber attachment for it about a year after purchasing. I have had others with nice bells and whistles, but frankly, this Silver Reed is, well, SIMPLE-Easy to use, reliable and very, very forgiving. The machine is known as the Kantan Bulky, 120 needles. Also known as the Singer BULKY 8. As it is an 8mm gauge machine. The BULKY 8 came in 2 versions, 120 and 140 needle beds. I haven’t found much else on these. 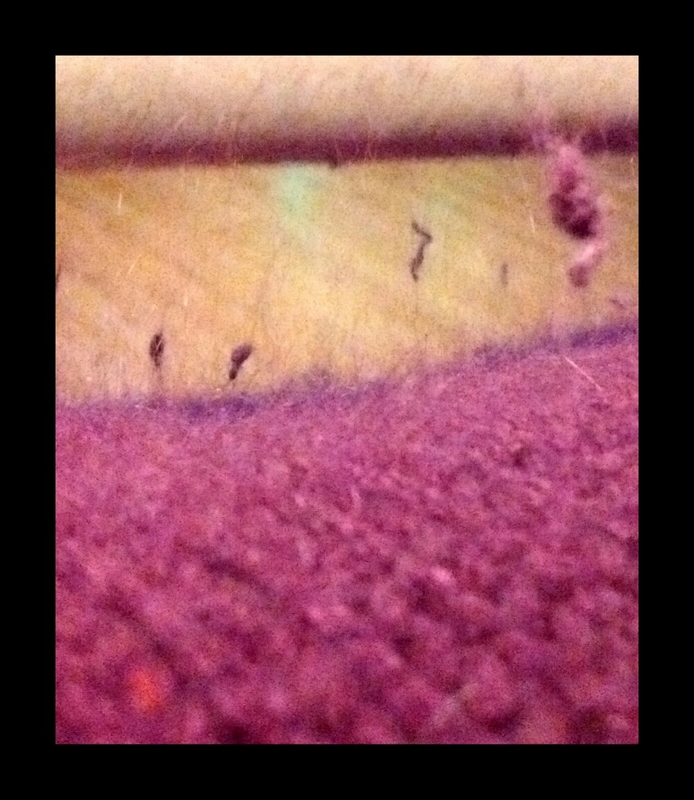 I believe there is an intarsia carriage, a garter bar, and a really nice travel case, but I have yet to locate them. It came with great tools, however you need to experiment with the techniques, as the manuals are very basic. The sponge bar….unlike all the others. It’s a 3/16 u-channel. Original had foam. I replace the foam with fabric folded in half, held in place with fabric covered rope trim….not sure what it’s called. This is really the only drawback!! I bought 6 balls of Reynolds No 1 Bi-Colore. I didn’t know the yardage. 40 grams per ball. Split the strands and doubled my yardage…gave 56 yards of turquoise, 56 yards of lavender. Frustrating attempt at 1000/167* didn’t turn out as advertised. Top pic is latest trial…tried enlarge position x 2. 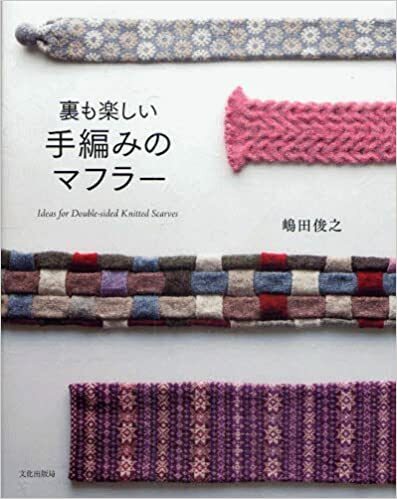 Different result but still not matching the pattern pic on page 38. Will attempt next using tech 169. Thanks Linda! Reclaimed Recycled Repurposed… What’s the correct word? What’s the right word to use? Recycled…yes it is, Reused…yes it is, Reclaimed…yes it is, Repurposed….yes it is. Of each, “reclaimed repurposed” is probably most accurate, but doesn’t fit the label so well. Each of the words has its own appeal and it’s own appropriate usage. But I really would like to know is there a “most correct” word to describe the yarn that was harvested from a used garment, cleaned, respun, and incorporated into the primary material of a new design? If I could get reader opinions that would be great! THANKS TO THIS GREAT PIN I HAD FUN MAKING MY OWN LABELS!!! So I thought I’d be writing about pesky yarn pills…(yawn). Started out with this color I can only describe as Magenta, this hue, deep and warm, like a royal velvet robe. The loosely knit sweater was incredibly soft to touch. I pushed back the others to discover disappointment, challenge, and hope…at the same time. I looked at the label and read some of my favorite yarn words….”silk” and “angora”. These words overcame the disappointment with the overall appearance….MAGENTA PURPLE YARN PILLS. Could it be resurrected? Why not? I checked the seaming, yes! Chain stitched. Checked the price $1.99, yes! Ok no holes or staining. It’s coming home. A shame this garment was in this state. What caused the pilling? It shouldn’t pill on the front or back where there is no friction. My guess, loose knit, loose spun, washing machine-felting was the culprit. Poor quality materials(? )…hmmm ok, let’s consider this article from WSJ. $395 for a high quality sweater might be reasonable in my head, if the Queen knit it. Otherwise, from what I read here, the consumer has to gamble that their purchased product will hold up. 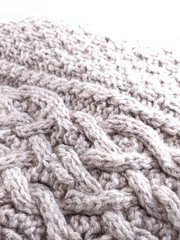 I couldn’t wait to see what I could do for this Yarn, as by its appearance, would NEVER again live as a sweater. On home, hand washed in Woolite, laid flat to dry. There was some bloom from the Angora, and shimmer from the silk. Still beautiful to touch, awful to look at. I grabbed the trusty stitch ripper and unlocked the collar seam. The Large Cowl collar seemed to leap off towards a new beginning. The yarn was 5 strands of 2-ply accompanied by a nuisance strand of Lycra. The 6 had barely a twist to them. As I wound the yarn from the cowl neck, I removed the pills that didn’t fall off as part of the unraveling. I set aside the newly reeled yarn, estimated about 100 (or so) yards. I hoped giving the yarn a tighter spin, and a tighter knit stitch, it could become a supple neck warmer. Out came the spinning wheel and …ugghh, what should I ply it with? Oh- I have a spool of multicolored Sulky somewhere….there it is. I plied up a small amount to swatch. Really liked the outcome. 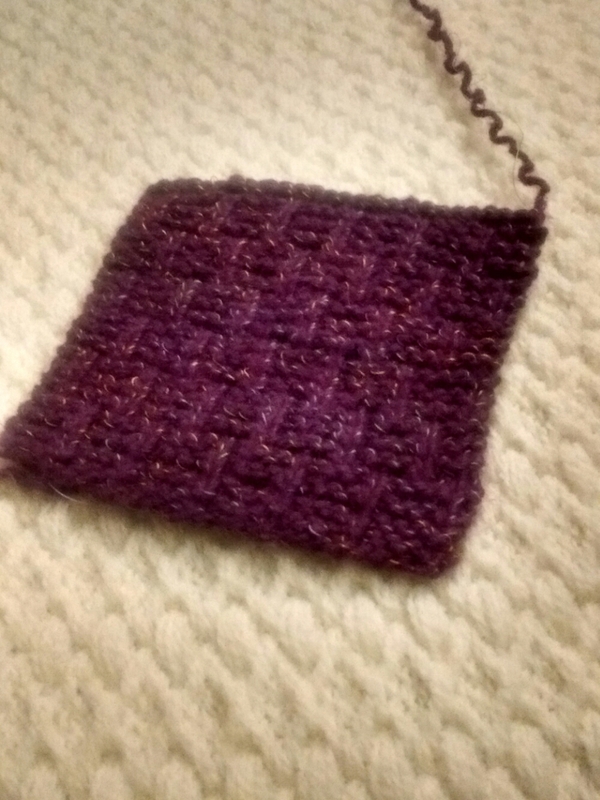 The swatch, (below stitch pattern) gave 4″ square with 26 sts and 42 rows on US size 5 needles. Repeat between * and * to end of row. 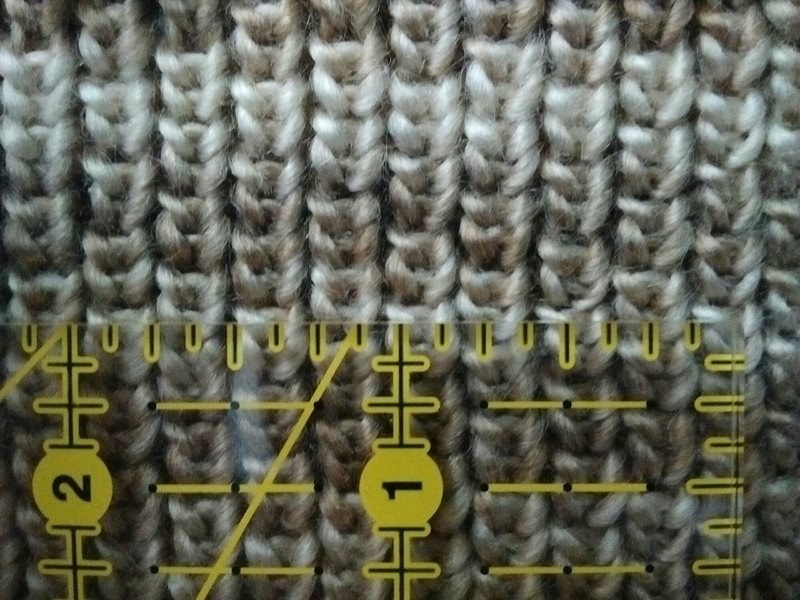 Row B (right side) knit to end of row. 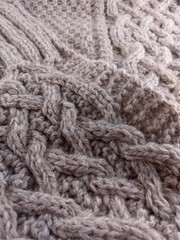 Row D (right side) knit to end of row. So much for those magenta purple yarn pills!! 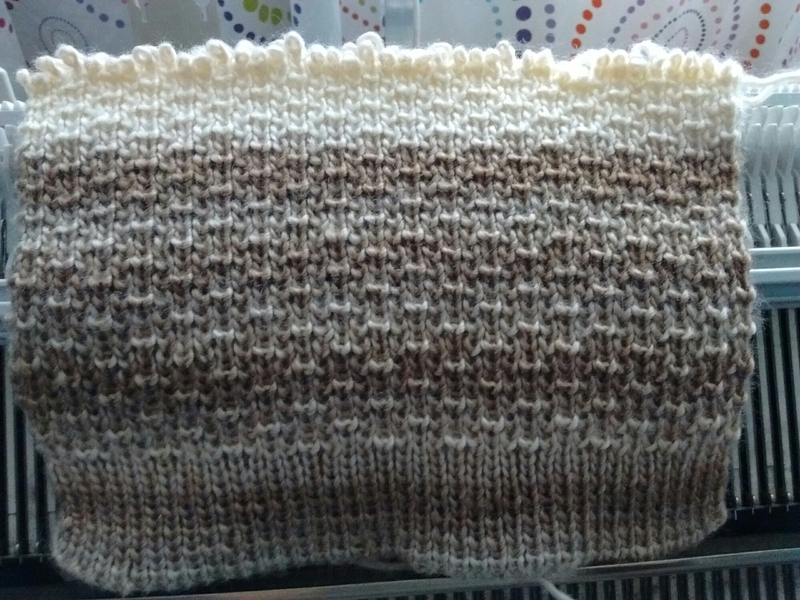 On to the neck warmer…stay tuned!! It was a simple solution. That’s what drove me to the idea. For many years I have noticed I love to choose challenging projects.cooking from scratch, gardening, knitting….I’m just not satisfied with steady state, “run of the mill” work. 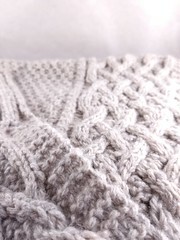 So I challenge myself with Veganism, subsistence gardening, building my own spinning wheels and raw wool combs, super crazy reverse Knit cables from a Japanese knitting Cable book, or the other extreme, historic Shetland shawls, Estonian lace (Thank you Nancy Bush) and you guessed it cobweb lace, as seen in Skaska designs. (I’m also challenged to write short sentences….still working on that!!) This unfortunate fascination, however often means I sacrifice one project for another, or once I learn a new technique, I’m ready for a new challenge. But I hate the idea of investing money in a project before I know if I will like it!!! Or if i will finish it. Simple economics on this one. If I were going to spend the time to learn to knit lace with cobweb yarn, how much would the yarn cost and would I really use it? So, to the thrift shop I went. Found an extra small, 100% cashmere, short sleeve, Knit top that had been horribly tiedyed camo blue. $1.99 later I was at home, hand washing, drying and unzipping the chained-linker stitches holding the collar, sleeves, and front and back together. Vioila, I successfully disassembled the sweater. Pulled the cast off rows apart and begun winding the tiny cashmere thread onto the ball winder. It was fascinating. My children and husband just looked at me funny. They left me alone. I was happy and content just watching the shades of blue, randomly placed, Knitted back up into a small triangular lace pattern (thank you Piecework and Nancy Bush) I was learning, on size 1 needles. And so began the addiction. 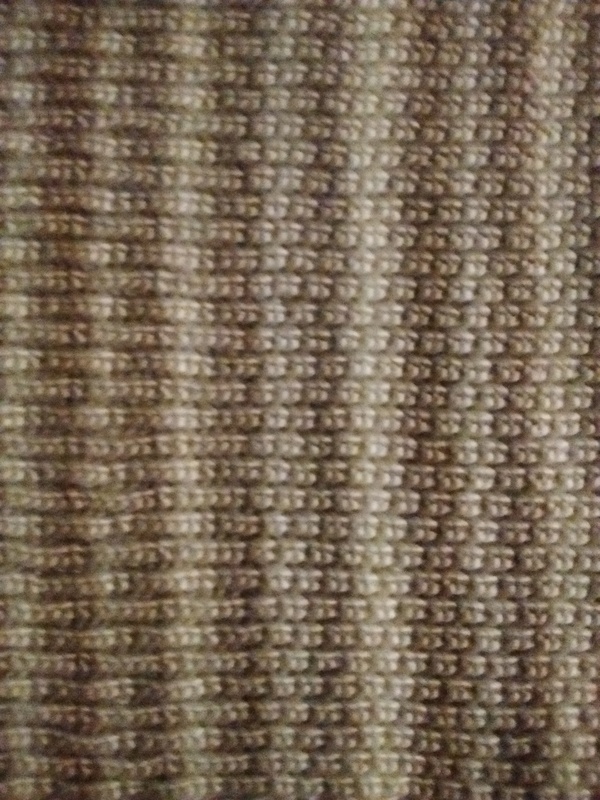 Luxury fibers, in greater quantity, for a fraction of the cost. Yes there are some drawbacks….extra time, 2nds stigma, but if treated properly, and blended with other fibers, they now become unique, soft, & repurposed – lovely yarn always available….no waiting. 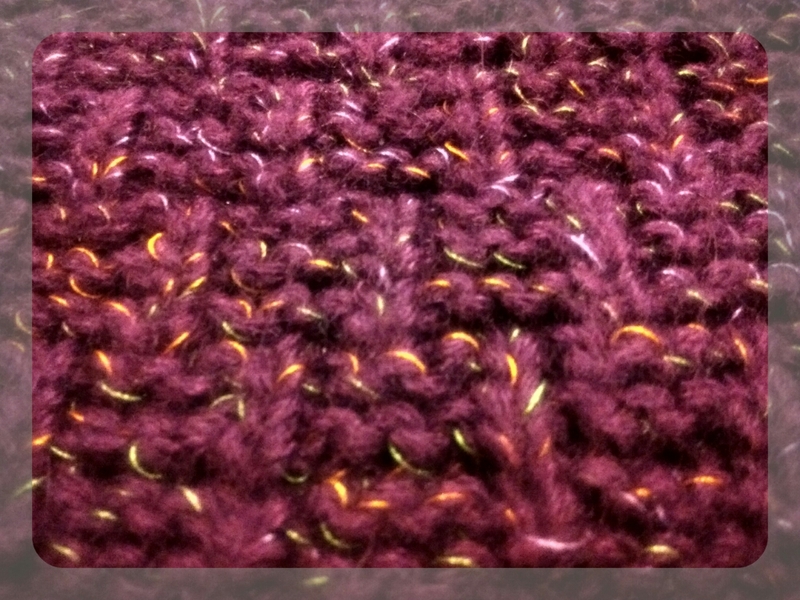 Tonight’s Picture at top, is cobweb cashmere/angora blend… repurposed from a donor sweater. What’s a 2nd life yarn? 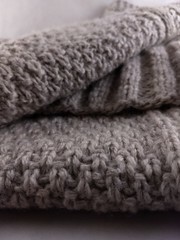 Tales of a 2nd-life yarn are not the details of the life of an old sweater, but of how I reclaim RaszyFibers and craft unique products suitable for crafters of all trades. RaszyFibers are 100% post consumer recycled product from carefully selected sources. When selecting the source, I focus on texture, fiber type, and color. Products are crafted for other fiber artists, papermaking artists and scrapbook enthusiasts. Have a need for a small quantity, special fiber type and color for your application? Send me a request, I am up for the challenge! 866 times by other awesome people!